The City Beautiful, Chandigarh is smeared with ghastly deaths when a serial killer is brutally butchering few women one by one. The motive, the agenda, the pattern and the clues are just the same, victim after victim, leaving the city, the police and the media in panic. But what disturbs CBI Agent Kinjal is why the killer has surfaced now after murdering her mother 5 years ago! Emotionally devastated but determined to unearth the truth, Kinjal starts to unravel the mystery only to discover that one of the people she trusts most, maybe the killer. Was it Vikash, the man she loved deeply or was it Milan, the one who loved her deeply? Was the killer her adorable brother in law, the aunty next door, her crippled father or her boss itself? Each piece of evidence, each vital finding by the forensics, each moment clouded Kinjal's mind with doubts ! But she was not the one to give up easily...or was she ? 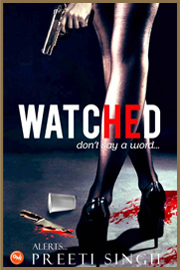 Being watched by creepy eyes constantly, can she find her mother's killer and be safe herself ? Or will she be the next victim ?